This beautiful shoulder bag is hand-crafted by Chirada Loetparisanyu with cotton and leather trimming. 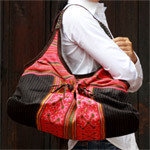 Its exterior is decorated with fascinating patterns woven, embroidered and stitched by hand by hill-tribe artisans. It closes with a zipper and is lined with cotton. The interior features three inner pockets, one to hold a small cell phone and another one with zipper. Leather handles complete the design. 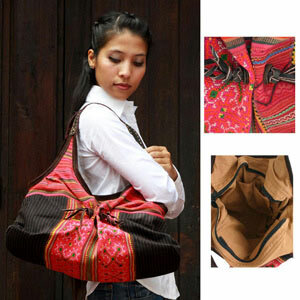 This bag will lend a colorful hill-tribe touch to any wardrobe. Materials: Cotton 95% and leather 5%.